From the latter part of 2015 we've brought you all the details and drama surrounding the sale of Starwood Hotels to Marriott Hotels This worried a lot of Starwood Preferred Guest members (SPG) as SPG tends to be more rewarding than Marriott especially in how they treat their elite members. In September of 2016 we learned many details of the Marriott takeover and overall everyone on both sides seemed to b happy with the linking of accounts, status matches and points transfers that were provided by Marriott. Ultimately we know that SPG and Marriott Rewards will be merged into a new program sometime in 2018. Until then, the SPG program is still one of the most valuable programs out there, in fact if you look at our Top 5 Travel Rewards Currencies for Canadians you'll see that SPG ranks 4th overall! The program is still prime for taking advantage of by loyal SPG members, Marriott Rewards members and even those not loyal to the brands but looking to rack up some more airline miles and this can be done by using the SPG Amex card. That brings us to the topic of this post. We still are constantly asked whether applying for the Starwood Preferred Guest Credit Card from American Express is still worthwhile. And the simple answer is yes! That is why we still ranked the card as the number 1 hotel card in Canada in our 2017 Top Travel Rewards Credit Card rankings! Seeing that you have nearly two years to use the points before an integration or amalgamation there is more than enough time to make use of the very valuable currency. Use the points for Starwood stays of course! We value Starpoints at well over 2 cents each so the sign up bonus is worth $400 at a minimum. If you apply for the card and put your $1,500 spending on it as soon as you can you'll get the 20,000 Starpoints on your first statement date and those will post to SPG within a day or two after that. Now the questions is what can those 20,000 Starpoints get you? Only 20,000 Starpoints for a Junior Suite with ocean view. If you pay cash, the non-refundable, prepaid rate is EUR755 or about $1074CDN!! That's almost a 5.4% return on your points. Go for two night with points + cash for 20,000 Starpoints and $360 USD (C$485) versus C$2,148 in outright costs. That's a savings of C$1663 or a value of 8.3 cents per point (16% when you earn 2 points/$ at Starwood & Marriott hotels) THAT'S HUGE!!! Only 12,000 Starpoints per night for a superior suite. If you pay cash, the non-refundable rate is C$489 so you are getting ~4.1% per point in value. Another amazing benefit from SPG is the ability to transfer the Starpoints to well over 30 airlines from around the globe including Aeroplan. What is even better is that SPG will bonus you 5,000 miles each time you transfer 20,000 Starpoints to any of their airline partners. This means the sign up bonus with the card is actually the equivalent of 25,000 miles with all but a couple of partners. Aeroplan is one those that you would get 25,000 miles. For most of us Aeroplan is the obvious choice but some other front runners are British Airways, Alaska Airlines, American AAdvantage, Cathay Pacific Asia Miles or Air France KLM Flying Blue. 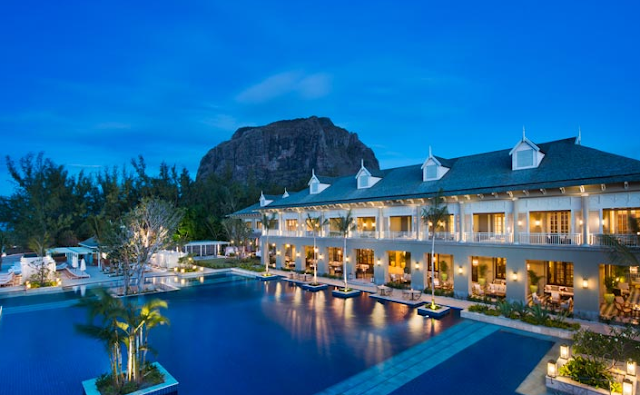 Say you have the 270,000 Marriott Rewards Points and want to convert to Aeroplan you could convert directly and get 90,000 Aeroplan Miles but why would you do that when you can use this package and get 120,000 Aeroplan Miles plus 7 nights at a Category 1-5 hotel! 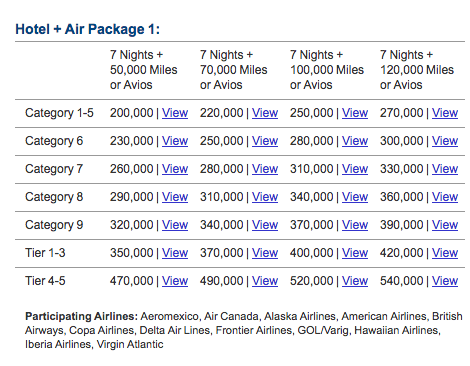 You can find out more about Marriott's Hotel+Air Packages here. Finally you could just hold onto the points and keep collecting as you spend on the card and redeem for higher end hotels before 2018 or keep going for multiples of 20,000 Starpoints to transfer to an airline partner. Ultimately if you don't do any of that the points that you are holding onto will transfer into the newly merged program sometime in 2018. 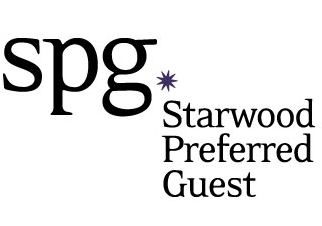 Clich here to find out more or to apply for the Starwood Preferred Guest Credit Card!